Hello everyone! I hope you survived part one of the holiday season. I was super busy the entire week and then I totally vegged out this past weekend. Today is December's Lacquer Legion and the prompt is, appropriately, REFLECTION. I had a lot of ideas for this one. I thought about recreating some looks from the past year, or documenting some of my favorite times...but in the end, I decided to take the literal route with my nails (chrome polish, of course!) and do the real reflecting via my words in this post. 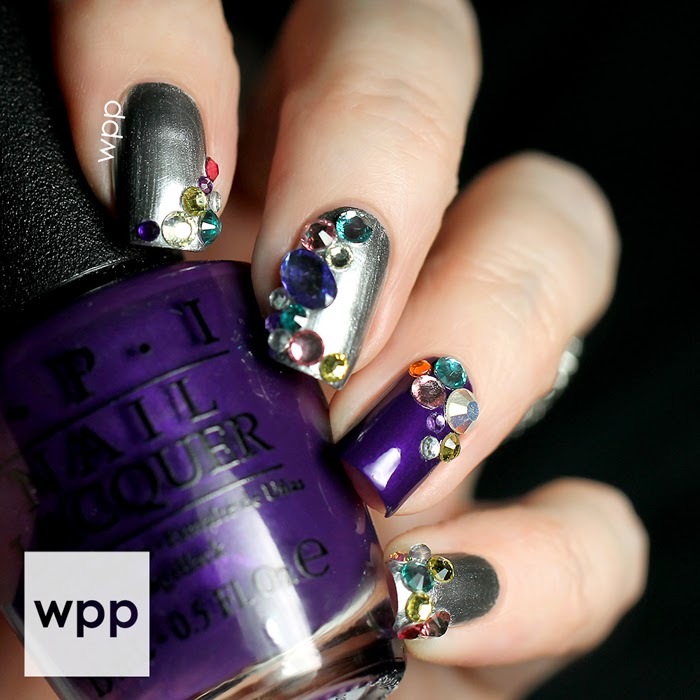 So first, let's get to the nail art, then keep reading if you're interested in my thoughts on 2014, what's in store for WPP in 2015, and the future of the Lacquer Legion. 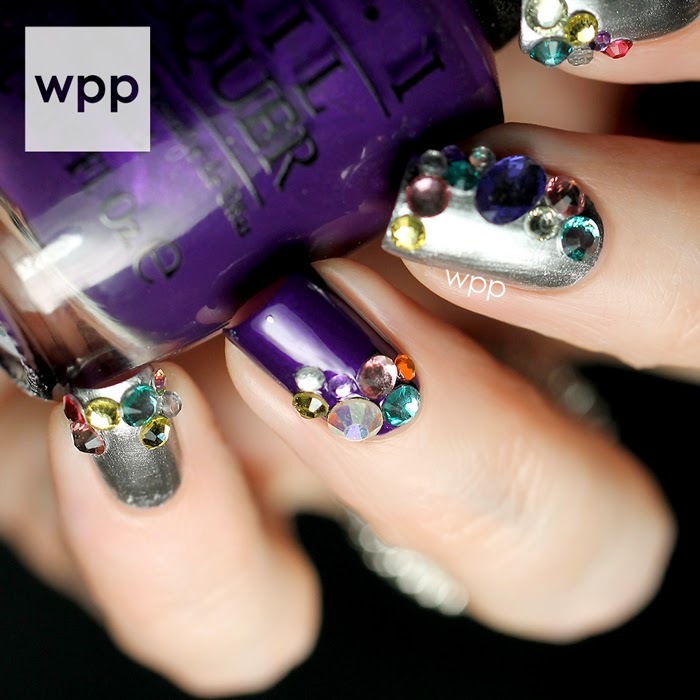 This blingstastic look screams New Year's Party, doesn't it? I seriously could not stop looking at my nails. The chrome is Push and Shove from Gwen Stefani for OPI. I used the associated base coat, Lay Down that Base, first - followed by two thin coats of Push and Shove. The chrome really develops as it dries and the result is a super mirrored finish. My accent nail is OPI I Carol About You from the holiday collection (also Gwen Stefani). It's such a rich purple with a subtle, luxe shimmer. Unfortunately, I had to dull the chrome finish a bit with topcoat in order to place my rhinestones. I arranged the stones on the table first for each of my fingers that way I wasn't rooting around for stones as the topcoat dried. The pattern is totally random. I just went for a different look on each nail. I love it! 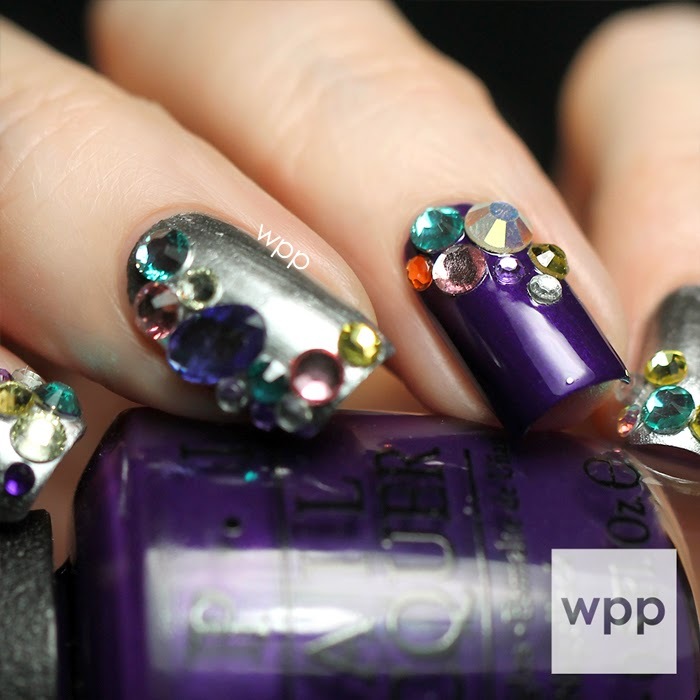 Actually, I don't think topcoat dulled the chrome finish too much, especially with the additional bling. If I was going to wear this to a party, I definitely would use a little nail glue. I'm old and boring though, so topcoat's enough for my lifestyle. LOL! I try to look at every single Lacquer Legion mani on the interwebs. Make sure to use the #LLReflection hashtag so we can find you. Check out the Lacquer Legion Facebook where we’ll feature some of our faves at the end of the day. So this year started off with a huge bang. If you remember, I was smack in the middle of Blogging for a Cause, my guest blogger series to benefit The Polished Girlz. 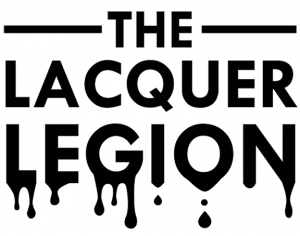 January was also the month that The Lacquer Legion was born. Conceived by Sarah of Chalkboard Nails as a way for the nail community to come together in a no-pressure, all-inclusive, challenge-like environment, Sarah and the admins (work/play/polish, The Nailasaurus, and Rebecca Likes Nails) were thrilled to see you all rally with amazing nail art. I, for one, discovered lots of new friends and talent. Having said that, we believe the Legion has run it's course. So today's challenge will be our last. Even if you don't get a post up today, please do consider "reflecting" with us and showing off your stuff. I'll still be commenting on all of the awesome manis and our faves will find their way to the Lacquer Legion facebook later in the day. Thank you so much for participating with us! It meant a lot! As for WPP, I'm not going anywhere...just trying to hone my focus and not put as much pressure on myself to do it all. I've been fortunate to have so many great blog-related opportunities come my way - although not all of them equaled a post on the blog. So even though my posting has slowed, I was (and am) still very much involved in all things polish, including writing regularly for NAILPRO Magazine, doing some nail photography, and even a personal appearance or two. Many of you know that I also work a demanding full-time job. As these opportunities came in, there was simply no "overflow" room and something had to give. As a result, the blog is taking up a smaller piece of my life's "pie". I also need to work in more "me" and family time - two things that have been woefully neglected. I have big plans this winter/spring to give my daughter a fandom room makeover, get our basement cleaned out once and for all, and attempt to ramp up the exercise. We'll see! Even still, I remain committed to blogging and to my dear readers who have been with me since the beginning. What an exciting 2 1/2 years it has been! While my posting may not be as frequent, know that if a post is up...it's worth a read! I still plan to post whenever possible (aiming for 2-3 times a week), cover CPNA, and stay very much engaged in the nail community. I hope you'll continue to stick with me even if there's not as much regular content. I appreciate you all so much! And I wish every single one of you my very best wishes for a wonderful 2015.